How to use a looper pedal? Whether you are an experienced guitar player or a beginner, you might find your creativity limited because you can only play one instrument at a time with your two hands. If you are not in a band or if you do not have another guitarist to help you, creating new music and presenting new ideas could prove difficult. In order to help you, engineers developed the looper pedal, a guitar effect which could prove essential. A loop pedal for a guitar, also known as a looper, is a gadget used to record a part of your performance or song idea and then repeats it – basically, the line is put on a loop. You can play the recording to yourself or your bandmates, repeating it until you have found a new idea to complete that section. While playing back, the looper can also be used to adjust tempo, pitch, volume and more. 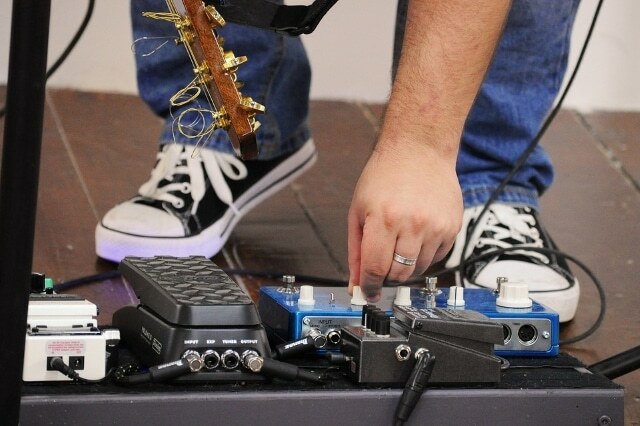 Another excellent use for a guitar looper pedal is to add more guitar layers on a song, during a live performance, without having to use actual backing tracks or another guitar player. Record the original part and play it when the time comes, while you do something different on your guitar – you will have a backing track which can be adjusted to your liking in the moment. There are many loopers available on the market, each with extra functions and perks; which the best looper pedal is will be left for you to decide in time, but the basic features are commonly found on all devices. A very simple looper pedal, suitable for a beginner, is usually a box-shaped thing with one footswitch and one level adjustment knob. You will control the looper with the footswitch – it can be used to start recording a part of your song, to play it back and to stop the playback. Most models will have an option allowing you to quantize your loop, which avoids issues regarding timing. More professional models will have controls for other functions, such as undo/redo, overdubbing or other effects such as pitch shifters. The more expensive and complex models will feature a lot more: effects such as distortion, chorus, phaser and delay or reverb can be included on the same device, to give you more versatility and to allow you to experiment with different sounds without having to record different pieces every time. 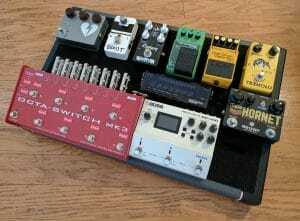 Some pedals allow more than one guitar to be connected to them, and this can prove very useful when rehearsing or composing new songs with your bandmates. 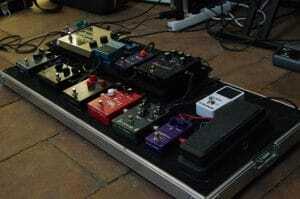 Usually, guitar teachers recommend their students to buy a looper pedal for a more comfortable and exciting practice. A straightforward exercise, to begin with, is learning how to open and close the loop. You can start by choosing a chord you like; after you have decided, hit the footswitch, play your notes, count four beats and then hit the switch again at the end of the bar. By repeating this, you will learn to open a loop just on time. As you are getting more comfortable with using a looper, you can go to other, more complex exercises. One example also concerns timing – strum a chord eight times in a row with the looper recording, and after the last chord and before the next beat, stop the recording and close the loop by using the footswitch again. After you manage to perfectly time a loop, you can start playing more complex patterns which can be used for improvisation or demonstration of a new song. Now, you can try playing two different bars; record each one separately on your looper and try to time the end as best as possible, so that the rhythm continues without pauses. Once you manage to do this, you can start improvising over the loop. There are many other exercises concerning timing; when it comes to improvisation, you can learn quite a lot by practicing overdubbing. This is not too difficult: you have to use the footswitch to record over an already set-up loop, creating a rich and complex sound. Most pedals have similar switches, but to understand how to use them for overdubbing, read their instruction manuals where things are clearly explained. For a beginner, it is advisable to start learning the art of using a looper with a simple, less expensive device. The TC Electronic Guitar Ditto is one of the simplest models available – it only has one footswitch and one level adjustment knob. It offers 5 minutes of looping time, more than enough for practice and also for performances. The only control knob is enough for essential touches, and if you do not like dealing with many different sound effects and options, this is the item to go for. Another simple model is the Digitech JamMan Express pedal. The manufacturer is known for their vast experience with different guitar effect pedals and processors, offering good quality for affordable prices. This particular model has two pairs of input and output jacks, and its metal body gives it excellent durability. It has a 24 bit and 44.1 kHz sample rate. The stereo recording time offered is of up to 10 minutes. If you want something more from your looper, you can go for the Vox VLL1. This affordable gadget is not only a looper – it can work as a delay effect and has other classic guitar effects which can be added to your recorded loop. Suitable for beginners too, it could be their first step into the world of more complex effects, such as distortion, phaser, and crunch.